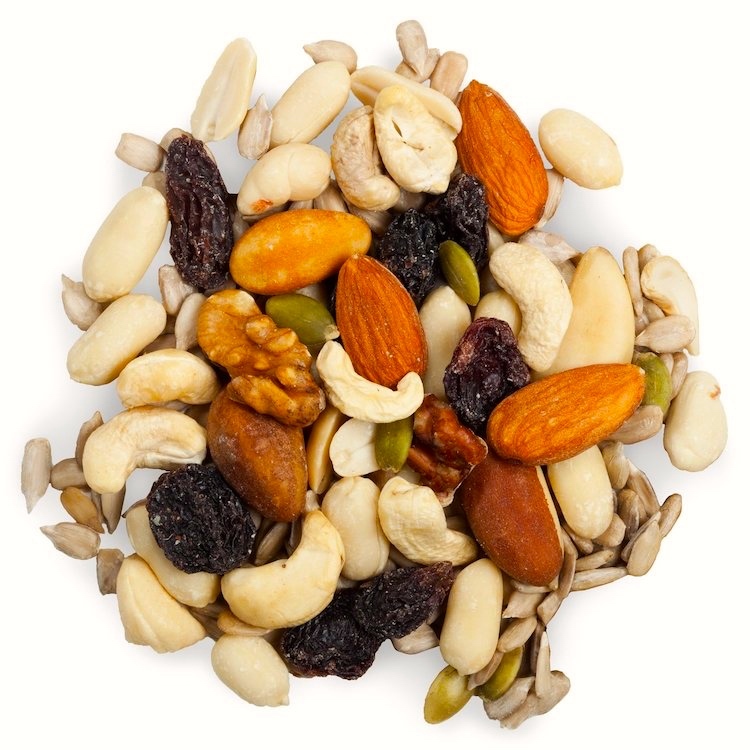 noun trail mix: a mixture of dried fruit and nuts eaten as a snack food, originally by hikers and campers. English names for the mixture — trail mix and gorp — have been around in North America for 40 years or so. Hiking and camping (and mountain-climbing) for pleasure (rather than necessity) go back well before that; the practice seems to have become widespread in the 18th century, in loose association with the appreciation and celebration of Nature in European Romantic movements. colloquial (orig. and chiefly North American). A mixture of dried fruit and nuts, often with seeds and other high-calorie foods such as chocolate, eaten as a snack food, originally by walkers and campers. Its popularity with hikers accounts for its alternative name, trail mix. 1972 K. Craighead & D. Craighead in National Geographic May 581/1 Along the trail, we munch candy bars or ‘gorp’— a mixture of raisins, nuts, and sweets. 1994 Outdoor Canada May 28/1 Lunch needn’t be a fancy affair… It can be as simple as pulling ashore for a half-hour breather, a cup of coffee and a can of sardines, or a swig of lemonade to wash down a few fistfuls of gorp. 2000 Wired July 218 Stuff the new, stronger micro-ripstop nylon bag’s 1,800-cubic-inch cargo hold with a climbing rack, your fleece, and some gorp. 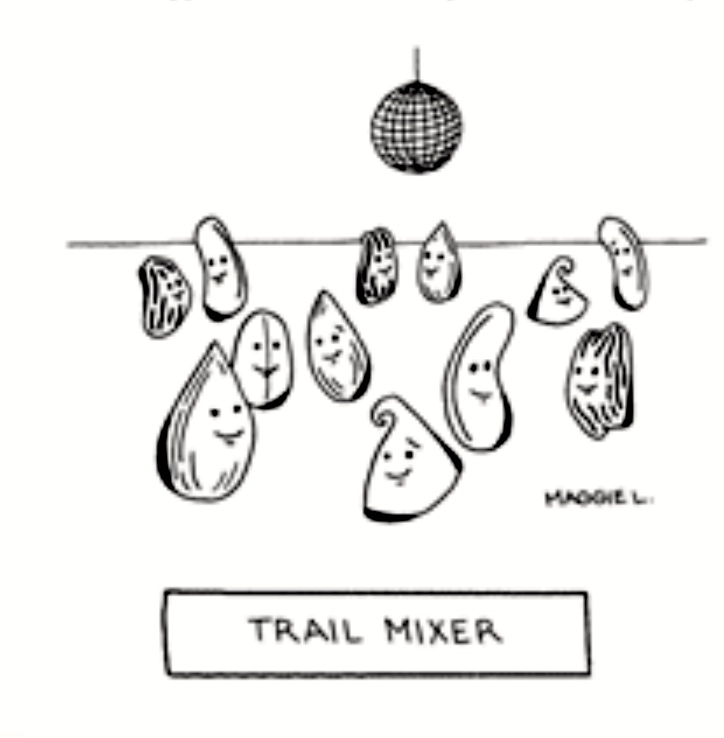 trail mix n. orig. and chiefly North American = gorp n.
1977 Washington Post (Nexis) 1 Sept. g26 We tried several kinds, good and not so good, before locating what for us was the perfect Trail Mix. 2001 Palm Beach (Florida) Post (Electronic ed.) 1 Mar. A Tupperware bowl filled with cheese-flavored trail mix — with cooked mealworms added for flavor — also made the rounds. Perfectly mixed to get you going. Our gourmet nuts & seeds are packed full of protein giving you the burst of energy you need. Featuring: raisins, blanched peanuts, pecans, cashews, walnuts, almonds, sunflower seeds, pepitas & Brazil nuts. 6. North American colloquial. A social gathering designed to enable people to get to know one another. 1916 Dial. Notes 4 277 A very successful mixer was given on Charter day. 1948 Downers Grove (Illinois) Reporter 21 Oct. 1/8 The Trojan Fathers Fall Mixer will take place Tuesday, Oct. 26 at the high school auditorium. 1988 Muscular Devel. Nov. 33/1 After his shows, Mits always throws a mixer where workers, guest posers, contestants and Mits himself can kick back and relax. 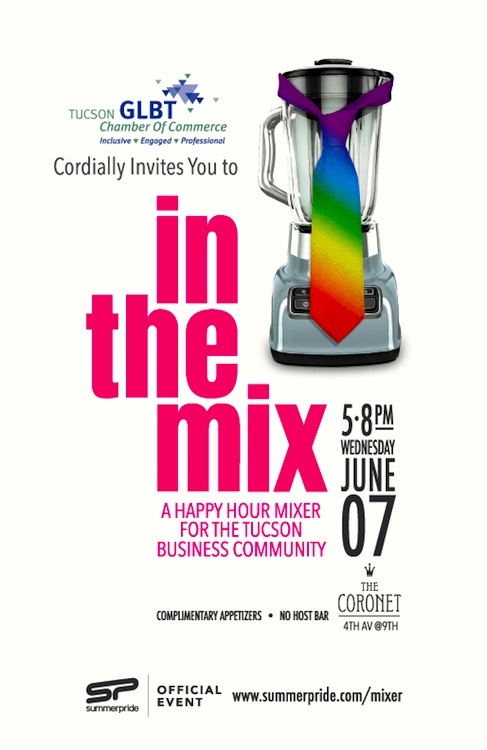 A mixer is a sociable event, so it’s different form a meeting or convention; it’s more specific than a gathering or a get-together; it’s different from a party because it has the purpose of fostering acquaintanceship; and it’s different from a date because it involves a number of participants (there are 12 in #4). Though this is by no means a defining characteristic, the canonical mixer, like the canonical date, is intended to foster romantic or sexual connection; it’s one of the customs of the sexual marketplace in the culture of the middle and upper classes in modern North American. I became familiar with the custom as an undergraduate at Princeton (then an all-male school), where mixers were organized with the Seven Sisters colleges, the aim being to afford everyone involved access to potential marital partners suitably assorted by class. The Seven Sisters is a name given to seven liberal arts colleges in the Northeastern United States that are historically women’s colleges. Five of the seven institutions continue to offer all-female undergraduate programs: Barnard College, Bryn Mawr College, Mount Holyoke College, Smith College, and Wellesley College. Vassar College has been co-educational since 1969. Radcliffe College shared common and overlapping history with Harvard College from the time it was founded as “the Harvard Annex” in 1879. Harvard and Radcliffe effectively merged in 1977, but Radcliffe continued to be the sponsoring college for women at Harvard until its dissolution in 1999. Barnard College was Columbia University’s women’s liberal arts undergraduate college until its all-male coordinate school Columbia College went co-ed in 1983; to this day, Barnard continues to be an all-women’s undergraduate college affiliated with Columbia. What are now usually called “disco balls” were first widely used in nightclubs in the 1920s. 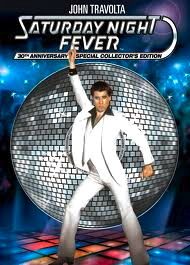 … In the 1960s, 1970s and 1980s, these devices were a standard piece of equipment in discothèques, and by the turn of the millennium, the name “disco ball” had grown quite popular. Ever looked at a cement mixer and thought “You know what? That thing would make an AWESOME disco ball!” Probably not. But French artist Benedetto Bufalino did. He didn’t just think it though. He actually went ahead and made one. And as you can see, it’s pretty freakin’ fabulous. 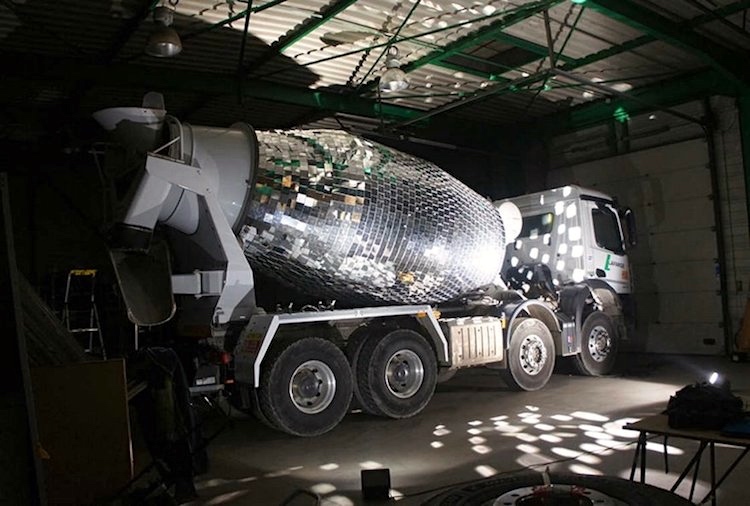 The installation – titled Disco Ball Cement Mixer – was parked on a construction site in Lyon, France [apparently in December 2017]. Bright spotlights were aimed at the truck so that when the mixer turned, it caught the light and threw out patterns just like everybody’s favorite dance-floor accessory. 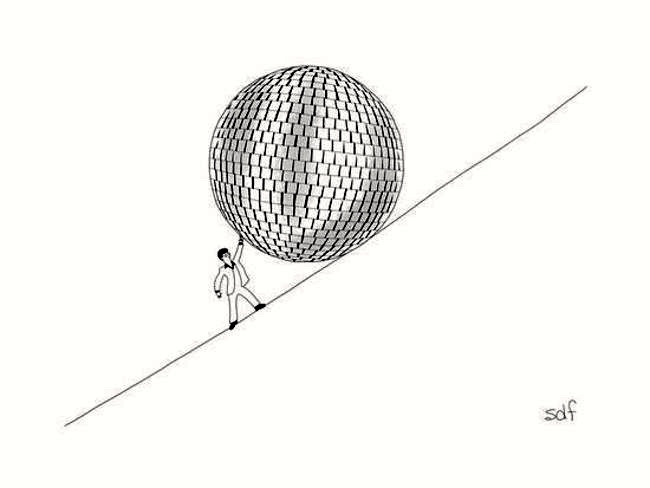 Nearby residents and passers-by couldn’t help but stop and stare at the unexpected spectacle, while others made the most of a rare opportunity to dance in the beams of the over-sized disco ball. And who can blame them! For a selection of Benedetto Bufalino’s works from 2007-18, many of them involving astonishing uses of motor vehicles (an overturned police squad car serving as a barbecue, for instance), see this site. This entry was posted on April 6, 2019 at 12:41 pm and is filed under Gender and sexuality, Homosexuality, Language and food, Language and the sexes, Linguistics in the comics, Phrasal overlap portmanteaus, Social interactions, Sociocultural conventions. You can follow any responses to this entry through the RSS 2.0 feed. You can leave a response, or trackback from your own site.